If you're trying to get more coconut into your diet for these health benefits, but you're like me and don't like the flavor in certain recipes, here's a recipe for people like us. Everyone loves this and it reminds me of how old-fashioned movie popcorn used to taste before they stopped using coconut oil (because it was more expensive than the cheap heart-killer fake oils they use now), and don't worry, the flavor isn't overpowering. It also keeps very well in freezer baggies for many days without becoming stale. (I don't know exactly how long because it doesn't last long around here.) I've even sent it to our friend, Nick, in Iraq and it travels quite well! By the way, some have trouble digesting popcorn, or they can only have a little, so keep that in mind just in case it doesn't set right with you. Wonder how in the world popcorn can be good for us? Or if it's gmo-free? Shouldn't popcorn be soaked since it's a whole grain? Click here to find out all of that and more. Have you tried coconut oil topically? I love this Moisturizing Cream. Try this kettle corn recipe if you want a little something sweet and salty. 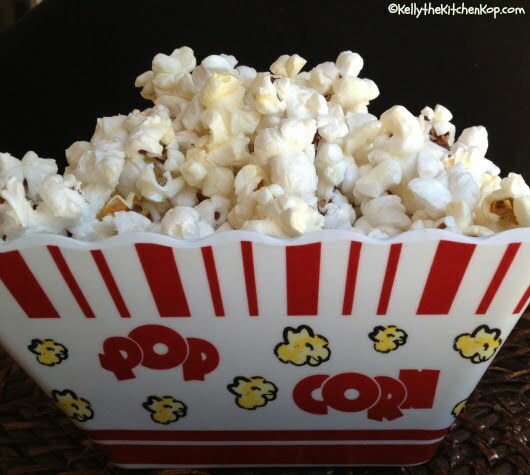 Click here for the popper we use: Stainless Steel Popcorn Popper. I've been through many popcorn poppers since we began eating healthier and finally found one I love! This one has no nasty Teflon, no dangerous aluminum next to your food (make sure you get the one with stainless steel throughout), and it tastes much better than when it is cooked in an air popper – those made the popcorn taste dry and blah. Read here about the many benefits of getting more coconut into our diets! Scoop coconut oil into your heated stove-top popper. Add popcorn and keep stirring until the popping stops. Pour popcorn into a bowl, and stir in the melted butter and sea salt. Shake or stir it around good then test to see if it needs more salt or butter. Enjoy! Comment below if you have coconut tips or more recipes with coconut – the more we can get into our diets, the better! Or check out this post for new ways to use coconut oil. Homemade CARAMEL popcorn – YUM! Kettle Corn made with coconut oil – much easier than caramel corn! Where is the truth on health and nutrition? I used to pop in a kettle back in the 50s. No more. Which is a safe microwave popcorn? I wouldn’t buy microwave popcorn at the store, they all have weird chemicals. My recipe above tastes the best and is the best for you, but if you have to use a microwave then pop the corn in a paper sack (closed tightly) then add plenty of sea salt and butter on top! 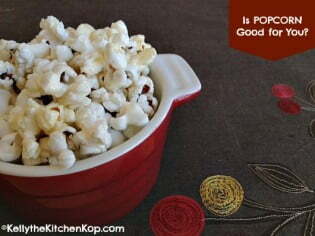 Microwave and air popped movie popcorn don’t hold a candle to old fashioned homemade, made right. I made some the other night and it took me back to my childhood, when Mom made it in a soup pot and served it up in paper bags covered in butter and salt. Yum! Refined coconut oil …then different seasonings. My fav is salt and chili powder. We use an air popper and either drench it in real butter or coconut oil after its popped. I popped mine with coconut oil a few times but found it upset my stomach. I use organic palm oil now, from a good source that doesn’t harm the critters. I think I might have a problem with coconut oil as it also caused a rash when I tried using it as a deodorant. Can a person be allergic to coconut oil? Bacon grease & butter while it pops then as soon as it’s done, let pads of butter melt down the side of the pot as you toss it! I like to use ghee. It gives it a nice buttery/nutty flavor while it pops! This maybe a silly questions, I looked thru all the comments and didn’t see anything that mentioned whether to melt the coconut oil first before you put it in the old fashion theater popper. My coconut oil is like lard. Anyone know? I love it this way but always have an allergic reaction to nutritional yeast. Anyone else have a reaction to yeast & anyone know why? Always wondered… Have no other allergies! Hubby can’t have dairy so when I make (organic!) popcorn for him, I drizzle it with melted coconut oil and then sprinkle it with nutritional yeast. He LOVES it! Yes! With garlic powder and salt. Yes, you could for sure, and it’s much better for you than whatever nasty vegetable oil they probably recommended. I love popcorn with coconut oil – I do it differently. I pop regular popcorn in a brown lunch bag…just cover the bottom of the bag with corn, roll the top closed, and microwave for 2 minutes…perfecto with no fat or mess then I melt a tablespoon of coconut oil in the microwave, and add it to the popcorn with a little salt. or add cinnamon sugar and a bit of salt. But the thing is, I *want* to get more of this healthy fat in our diets. Plus we try to avoid the microwave as much as possible. That does sound easy, though. Hi Kelly. I absolutely love all the wonderful information I’ve found here on your blog. I tell my ‘real food’ conscious friends all about it (and try to convert my other friends – lol). This is my first time posting and I just have a couple of questions about popcorn. Where can you find organic popcorn? 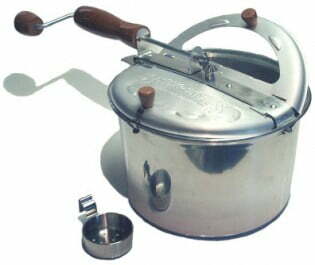 And the ‘Back to Basics’ brand is about $200, but I found a brand that seems exactly like it called Lindy’s that is under $45 (https://www.amazon.com/Lindys-Stainless-Steel-Popcorn-Popper/dp/B0034D5BIQ/ref=pd_sbs_k_4). Is this a case of ‘you get what you pay for’, or do you think the Lindy brand is ok? Youza! I’ll have to go check that link, the Back to Basics one I got was $30! Ghee works great! Omg, I made kettle corn with ghee and some grated palm sugar and it was the BEST EVER! The palm oil shortening from Tropical Traditions works very well for popcorn too – especially if you don’t want the coconut flavor. You can always add butter after it’s popped. I know with olive oil heating the extra-virgin that way turns all the antioxidants into free radicals. Not good. We LOVE popcorn made this way. However, I’ve been thinking. . . My jar of unrefined coconut oil says that it is made for cooking at medium heat (280F). I’m sure that the oil gets hotter than that when I make popcorn. Should I use the refined oil (labeled for medium high heat) instead. I wonder if I’m essentially refining the oil myself by subjecting it to high heat? If so, does this oxidize the fats or do anything else evil? I could really use some input on this one. Good question, hmmmmm, I have it that the unrefined smoke point is 350*, so I just keep it at medium heat and don’t scorch it. Maybe I should check and see how hot I’m actually getting it, though, and possibly use the refined coc. oil instead (that smoke point is higher). But I love the flavor of coc. oil in there! If anyone has time to check the temps that it takes for popcorn to pop and could let us know here, that would be great as I’m gone all weekend and buried in “catch up” next week. Wikipedia says that the corn pops at 356F, close enough to 350 to make me happy. I’ll try lowering the heat to medium next time; I’m generally an impatient cook and turn everything up as high as possible. Great facts about coconut oil! Never knew so much. Love your info. Coconut Oil? I guess… but with vitamin D deficiency in the news and all… I’m proud to say that I pop my corn in BACON GREASE! We started making popcorn with coconut oil a few months ago. The first time I made it everyone came in the kitchen and we all agreed that it smelled like a movie theater! It is our favorite way to make popcorn. So yummy! I just use a big stainless steel pot with a lid and shake. The pot is all dented from making popcorn so it is now officially our popcorn pot! I’ll have to look into the popper. It looks fun too. Thanks for posting about it! YUM! My son got his braces off and I’d promised him homemade popcorn. I’m so glad I found your blog with the link for this popcorn maker. I ordered it online and just had to drive to my local WalMart to pick it up. No burnt kernels and virtually no “old maids” at the bottom! Can’t wait to try the caramel corn! No, I’ve never tried that, because I love my popper so much, and also I remember as a kid how terrible it was cleaning out those pans after popcorn! I made your popcorn recipe last night! It was delicious thank you! I made it in a plain old heavy stainless steel saucepan with the lid on and I think it turned out perfect…Have you compared making your popcorn in a regular pan versus the popcorn popper? Is there a noticeable difference? Try adding nutritional yeast. I make mine like your recipe (coconut, butter, salt) after adding the butter, sprinkle nutritional yeast before serving. Adds a depth and saltiness plus the bonus of b vitamins. NO! That one is made with aluminum, which we try to avoid. Just wanted to let you know that I haven’t heard back yet with an answer to this question. My guess, though, is that unless you go through it very slowly, not refrigerating should be fine. Sorry I don’t have more definitive info for you. I’ve never refrigerated mine. I go through it pretty fast in the kitchen, but even the coconut oil that I keep in the bathroom (as a moisturizer), has never gone bad for me – never an off smell or anything. I’ve actually never heard of any going bad, but I wonder if keeping it cool retains more nutrients? Maybe I’ll post it to a coconut forum I belong to and see if anyone knows. I’ll get back to you! Question about coconut oil – I purchased some, but it says “freshest when refrigerated”. I did that and now it is hard and not easy to use. Do you refrigerate your’s? Spread plain popcorn on buttered cookie sheet. Stir together over medium heat until melted: A couple of tablespoons of brown sugar, a couple of tablespoons of water, tablespoon or so of butter, big pinch of organic sea salt, and big fistful of marshmallows (I’ll have to investigate a healthier version). Remove from heat and add vanilla. Drizzle mixture over popcorn and mix up with a spoon (or your hands if you let it cool slightly). When it cools somewhat (not completely), form into balls with buttered hands. Let cool and enjoy! So how did you get your popcorn into popcorn balls? I wanted to let you know that we used this recipe to make some yummy popcorn balls for our weekend treat. Very tasty with just a hint of coconut. Thanks! About the popcorn popper~~~does it come from Wal-Mart? I keep getting the Wal-Mart site and it says it is a Steel-clad with aluminum plate. Is that the one I want to order? I’m glad you liked it! I’m not sure if you got the oil too hot, but mine also bubbles right before it pops the corn. (Medium heat should probably be fine.) Mine also tastes coconutty, which I love along with all the sea salt and butter I put on, too! I love feedback, thanks for commenting! I agree! This popcorn is delicious! However, I’m wondering how to heat the oil. Unfortunately, I have a cheap aluminum pot, and am hoping to purchase the stainless steel version. Today I made this recipe, and when I heated the oil on medium over the stovetop, the oil started to bubble. I am nervous that I heated it too much, and am never sure if I’ve ruined it. It didn’t smell burnt, just very coconutty. Do you have any advice? Thanks so much! This brand of popper also comes in an all aluminum version (less expensive), but this one has stainless steel around the aluminum on the bottom, so there’s no aluminum by the food. Is there aluminum in this popper? The description states it has “a steel-clad aluminum plate for optimal heat dispersion”. A note about coconut oil: if you want to use it as moisturizer, just use the plain organic unrefined coconut oil. Buying the stuff that’s labeled ‘moisturizer’ just means there are other things in it and you’ll pay a ton more. It’s a little oily when you first put it on but it absorbs relatively quickly. I’ve been using it for nearly a year and it’s been great for me. 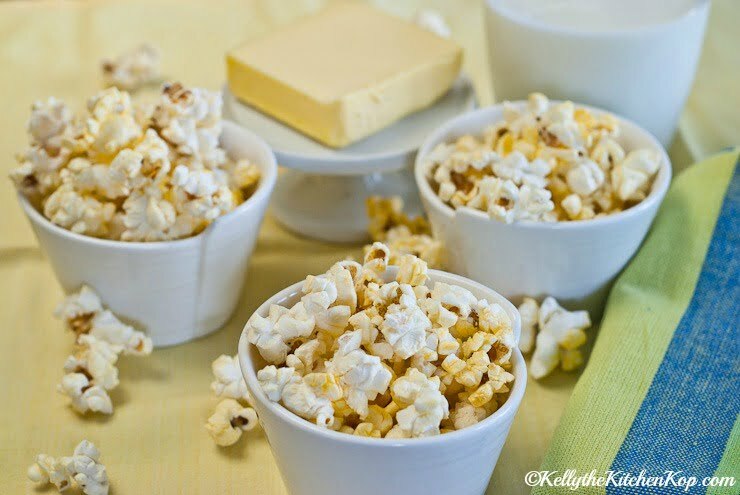 As someone who doesn’t love popcorn, I must admit I really love Kelly’s recipe! It doesn’t have the artificial and overwhleming flavor that you get from microwave popcorn. It takes delicious _and_ natural! Thanks again for your comments, and I can’t wait to hear what you think of the popcorn – don’t forget plenty of real butter and sea salt! By the way, since you love coconut, you’d love the book about all its benefits called, “Eat Fat Lose Fat” – there’s a link in the “About my favorite books” post. Holly, this oil does have a coconut flavor, but there are others (more about that in a future post) that do not have the flavor or smell. In the popcorn I think it tastes great though, and I normally can’t stand the taste of coconut. You’re lucky that you love it, it is SO good for you! Check back in a few minutes and I’ll fix the link – thank you for letting me know! I was going to double check those after I got the kids to bed! Kelly, I can’t get the popper link to work. I am curious what you use. I never thought of popping corn in coconut oil! I love the flavor of coconut. Does the oil taste like that?